KABUL: Chaired by President Mohammad Ashraf Ghani, the extraordinary meeting of cabinet was held Monday at Chahar Chinar Palace. Based on the meeting’s agenda, minister of justice delivered the meeting law on structure and jurisdiction of judiciary power, adding that the respective law was reviewed after approval of laws committee and instruction of the cabinet’s meeting and visions of the country’s Supreme Court was written in it and has been finalized in (9) chapters and (60) articles. After overall discussion, the cabinet approved in Principle the respective law and tasked ministry of justice to review and finalize the law in a session with participation of second vice president, chief justice and minister of justice. Afterwards, minister of justice delivered the meeting draft modification, inclusion and cancellation of some articles from law on personal affairs of military officers, lieutenants and staff sergeants, saying that the draft has been prepared in (4) articles and discussed and approved in laws committee’s session. The cabinet while approving the respective draft tasked ministry of justice to review and finalize the draft’s financial issues in coordination with ministry of finance and all other relevant institutions. Likewise, minister of justice delivered the meeting draft law on procedure of salaries, saying that the draft law has been reviewed based on instructions of cabinet meetings and high rule of law council and approved in (7) chapters and (67) articles by laws committee. After overall discussion, the cabinet approved the draft law and tasked ministry of justice to accurate and finalize the respective draft law in consideration to mentions and amending views of general directorate of administrative affairs. Subsequently, draft modification and inclusion in some articles of law on government cases delivered by minister of justice to the meeting and was asserted that the draft has been prepared based on decision of high rule of law council’s meeting and was approved in a session of laws committee. The cabinet approved the respective draft and tasked ministry of justice to accurate and finalize the respective draft law in consideration to mentions and amending views of general directorate of administrative affairs. Afterwards, minister of justice delivered the meeting draft law on support from those informing corruption crimes, saying that the draft has been approved by laws committee’s session in (5) chapters and (33) articles. The cabinet approved the draft law and tasked ministry of justice to accurate and finalize the respective draft in accordance to mentions of the meeting under supervision of second vice president. Afterwards, minister of justice delivered the meeting draft modification and inclusion of some articles in law on land management, saying that the draft has been approved by laws committee in (3) articles. After overall discussion, the cabinet approved the draft and tasked ministry of justice to finalize the respective draftin consideration to amending views of general directorate of administrative affairs. At the end of the session, acting minister of mines and petroleum delivered the meeting an agreed draft of Herat’s Shaida copper mine contract. Acting minister of mines and petroleum added that based on decision of high economic council, a committee tasked by the ministry, national procurement authority and advisor office of president on infrastructural affairs and talks process with Silk Road Company have been started. 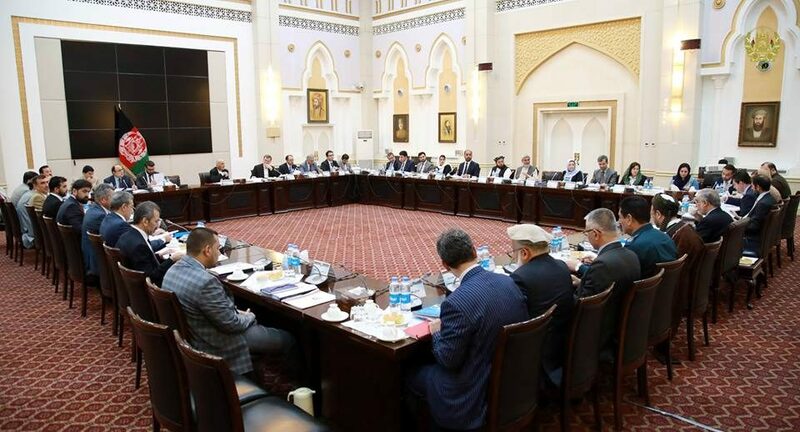 After overall discussion, the cabinet of the Islamic Republic of Afghanistan approved modifications and suggestions of the respective contracts.